A commander of the Palestinian militant group battling Lebanese troops from a northern refugee camp has reportedly pledged to escalate the conflict. Abu Hureira, a senior Fatah al-Islam figure, told Associated Press his group was ready to take up arms in Lebanon's largest refugee camp, near Sidon. Earlier, two Lebanese soldiers were killed in that camp, Ain al-Hilweh, in fighting with another militant group. Separately, a bomb exploded on a bus in Beirut, injuring seven people. More than 100 civilians, militants and troops have died in the fighting at the two Palestinian refugee camps in the past two weeks. The fighting in Ain al-Hilweh involved militants from the Jund al-Sham group, a Palestinian splinter group similar to Fatah al-Islam. The two groups reportedly have family ties and share a radical Islamist ideology. However, Abu Hureira told AP that the deaths in Ain al-Hilweh were not linked to Fatah al-Islam's battle in the Nahr al-Bared camp, close to Tripoli in Lebanon's far north. Jund al-Sham was "not fighting on our behalf", he said, but would not say how many members of Fatah al-Islam were based in Ain al-Hilweh. "Soon there will be an official statement in the name of Fatah al-Islam partisans, and we will start to see an expansion, and there will be a similar military situation there [in Ain el-Hilweh]," he said. It seems likely that neither group regards what happens in Lebanon as their priority, says the BBC's Middle East analyst Roger Hardy. Like jihadi groups elsewhere, he says, they see themselves as part of the much bigger battle between Islam and the West. A bomb exploded on an empty bus in a Christian district of the capital Beirut, injuring seven passers-by, security officials said. Lebanese television showed pictures of the blackened shell of the bus next to damaged cars and shop fronts. There has been a series of bomb attacks in and around Beirut since fighting began at the Nahr al-Bared camp on 20 May. In addition to the two dead in the Ain al-Hilweh fighting, at least five troops were reported wounded. There has been no word on militant casualties. Violence subsided after the initial exchange of fire close to the camp's entrance. One report said Palestinian factions held emergency talks with the Lebanese army to calm tensions. 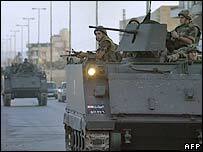 The Lebanese army has already sent reinforcements to the edge of the camp. In Nahr al-Bared, the army has been shelling militant positions deep within the besieged camp to try to force the militants to surrender. Clashes there continued overnight on Sunday, but subsided somewhat during Monday, reports said. Prime Minister Fouad Siniora has described Fatah al-Islam as a "terrorist gang" and said there would be no negotiations. A militant spokesman said they would fight to "the last drop of blood". The army has said it has not entered the Nahr al-Bared camp. There is a longstanding convention that the army does not enter Lebanon's 12 Palestinian refugee camps, leaving security inside to militant groups. Civilians in the camp have no access to power or medical help. Tens of thousands are thought to have fled the camp since fighting broke out, but thousands reportedly remain. Aid agencies have called for a ceasefire to allow more civilians to leave. But correspondents say the government and army appear in no mood to end the siege now. The violence is the worst internal fighting Lebanon has seen since the end of its civil war 17 years ago. Lebanon is home to more than 350,000 Palestinian refugees, many of whom fled or were forced to leave their homes when Israel was created in 1948.